I'm a deep level of dopey that makes strangers offer to help me carry groceries even though I'm totally capable...I'm just super awkward and uncoordinated. So when work helped launch Groove Therapy 101 in Brisbane & the Gold Coast (good job, Queen B! ), I thought it'd be a great idea to go along and embarrass myself in the name of team building. And also, I like to try new things. I've been going every week since! Groove Therapy isn't like other 'beginner' dance classes where you need at least some dance background plus the ability to follow choreography. The format for Groove Therapy is so much simpler - the dance therapist shows you a move facing the room, and you mirror them - that's it. You don't have to remember a bazillion steps, they read the room and simplify steps or add little extra grooves to suit the skill levels so everyone can follow along. Plus there are no mirrors and the lights aren't bright so you don't have to see what you look like, you just feel like a damn queen nailing all the moves (even when you aren't). I totally sucked for the first month at Groove Therapy because my body is not used to moving in a way that resembles having rhythm, but I eventually got used to mirroring the instructor, and even add my own little grooves once I nail the basics. In Brisbane, we play little dance games and end each class with a little combo which is a few steps from today's class combined. Wanida, the Brisbane dance therapist, is a little pocket rocket - so cheerful and energetic and encouraging, she brightens up my day and gets me pumped for the rest of the week! I notice I've been dancing along to music at work more as a result, and while I'm driving and singing car karaoke in the mornings. 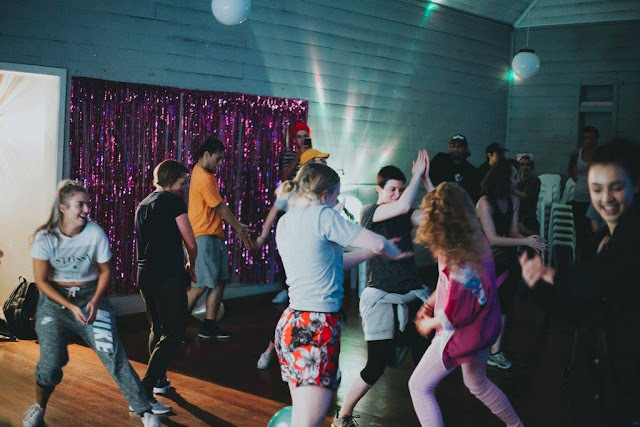 Seriously, dance brings so much joy - if you've ever wanted to groove along to things but don't know how and don't want to take formal dance lessons, get along to a Groove Therapy session and party in a super-chill and welcoming space! I love, love, love Groove Therapy. I start my week by partying with Groove Therapy Brisbane @ the Latvian Hall in Woolloongabba @ 6.30pm for an hour. They hold sessions in Brisbane, Gold Coast, Byron Bay, Sydney and Melbourne. Check it out: groovetherapy101.com.